In this tutorial, we will explain how to use DxO FilmPack as a plug-in for Adobe Photoshop Lightroom 4, Adobe Photoshop Elements 10, and Adobe Photoshop CS6. Adobe Photoshop CS6 offers a system of smart objects and filters that make use of TIFF and JPEG bitmap files so as to let you undo any corrections you apply. Plug-ins for Adobe are programs that add functionality to the publisher’s software. They are generally installed by default in the Plug-ins sub-folder in the relevant application. DxO FilmPack can run both as a standalone application and as a plug-in for Lightroom, Aperture, Photoshop, Photoshop Elements and, of course, DxO Optics Pro. Adobe Photoshop Lightroom 4, Adobe Photoshop CS6 or Photoshop Element 10. An image in JPEG or TIFF format. In this step, we will see how to set the preferences in Adobe Photoshop Lightroom 4 so as to best use DxO FilmPack as a plug-in. 1- File format: TIFF or JPEG (the latter is only available with Lightroom version 4.1 or higher). A universal uncompressed format, TIFF files do not lose information when saved, and this is one reason we recommend using it for your prints. The disadvantage is that TIFF files are very large. JPEG-format files are smaller, but saving them at a high rate of compression degrades the image quality. 2- Color space: Adobe RGB (1998) or ProPhoto RGB. The Adobe RGB space is perfectly suited for printing and produces very good results. ProPhoto RGB is a larger color space that should be used with, for example, landscape photos that have many gradations. 3- Depth: 8 or 16 bits (TIFF only). 8-bit files are smaller and compatible with many external programs. We recommend using the 16-bit format, which is larger but better preserves tonal nuances. 4- Resolution: Specify the value 240 dpi (dots per inch), the lowest resolution needed for a good-quality inkjet print. 5- Compression: None. This setting allows you to preserve the quality of the images that will be sent to DxO FilmPack. Close the Preferences window: the settings are immediately taken into account. You can also change these settings in the dialog box that appears when transferring images from Lightroom to DxO FilmPack. Select a photo from your Adobe Photoshop Lightroom 4 catalog. Go to the Photo menu and select Edit in > DxO FilmPack. You can also right-click on the image and select Edit in > DxO FilmPack in the context menu. • If you are working with a RAW file, only the option Edit a Copy with Lightroom Adjustments is checked, and the others are inactive. The file created for DxO FilmPack will incorporate all of the corrections made by Adobe Photoshop Lightroom 4. We recommend that you use this format. • If you are working with a JPEG, TIFF or PSD file, the Edit a Copy and Edit Original options are also active. 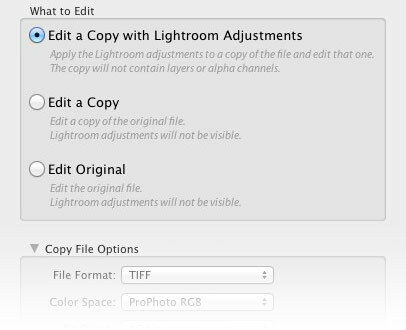 If you choose Edit a Copy, Adobe Photoshop Lightroom 4 will create a duplicate file. If you choose Edit Original, Lightroom will open the original file in DxO FilmPack and any changes saved to it will be permanent. At this stage, you can edit the file options defined in the Lightroom preferences. 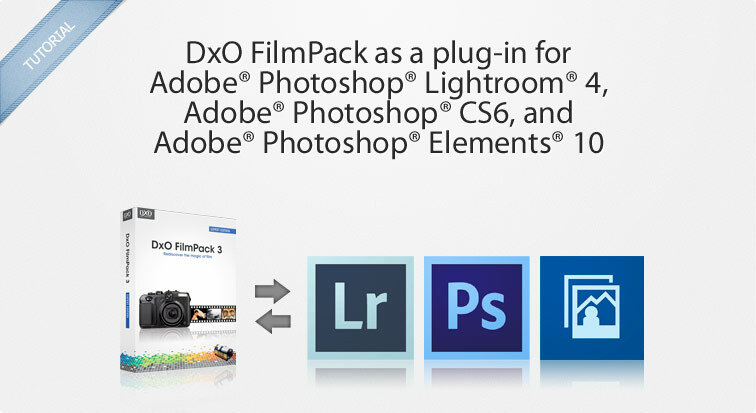 Click on Edit: Adobe Lightroom 4 creates a TIFF or JPEG file and launches DxO FilmPack. Once you have edited your image in DxO FilmPack – which gives you the possibility of applying up to 60 authentic film renderings and 25 creative renderings – click on the Save button on the lower right. DxO FilmPack closes and you return to the Adobe Photoshop Lightroom 4 interface, where your corrected TIFF or JPEG image (depending on your settings) will automatically appear next to the original image in a stack (labeled “1 of …”). The corrections made in DxO FilmPack are applied in a permanent way to files originally created in Adobe Photoshop Lightroom 4. If you open the file again in DxO FilmPack, you cannot undo or otherwise modify the corrections you have already made. The workflow in Adobe Photoshop CS6 is even simpler than in Lightroom, particularly when it comes to opening files. Open a photo in Adobe Photoshop CS6. 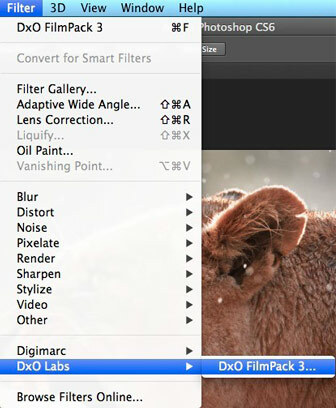 Go to the Filter > DxO Labs menu, then select DxO FilmPack. The photo opens in DxO FilmPack. Apply one of the available film or creative renderings, adjust any advanced settings if necessary, and then click on Save at the bottom right of the workspace. A few seconds after processing, DxO FilmPack automatically closes and you return to the Photoshop interface, with the changes applied to the original image. All you need to do now is save the image in Photoshop. Overall, the workflow in Photoshop Elements isn’t much different from that of Photoshop, except that you need to launch DxO FilmPack from the Filter menu in the Editor. Once you’ve launched DxO FilmPack, processing and saving your images takes place in the same way as found in the step 2 of this tutorial, “Edit your image in DxO FilmPack” (above). However, Adobe Photoshop Element does not provide all the same features as Photoshop, most notably in that you cannot work on 16-bit images. Using smart objects and filters guarantees that you can undo the corrections made to bitmap files, even after you close Adobe Photoshop. This Photoshop feature creates a layer on the image that consists of the DxO FilmPack treatment that you have chosen to apply to it. This means you can change your FilmPack settings as many times as you want. After you open the image you want to process in Adobe Photoshop, go to the Filter > Convert for smart filters menu. A message window appears requiring you to confirm the operation; to proceed, click on OK (you can also check the “Do not display this message again” box). The image is converted into a smart object, as indicated in the Photoshop Layers palette. Return to the Filter menu and select DxO Labs > DxO FilmPack. After it opens, process your image in DxO FilmPack, then click on Save on the lower right. The image automatically returns to Adobe Photoshop with the FilmPack treatment applied to it. Look in the Layers palette, where you will see that the DxO FilmPack 3 smart filter has been added. Right-click on the filter and select Edit smart filter in the context menu. This action will reopen DxO FilmPack, in which you can keep or modify your settings, or apply another rendering. Click on Save to return to the Adobe Photoshop interface. Your image has been changed per the edits you made during the second session of DxO FilmPack. Save the file by going to the File > Save As menu. A dialog box will open; check the Layers button to save the layers with the file in case you may want to do more editing later. 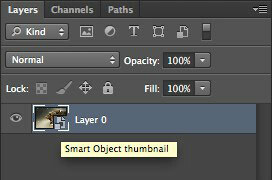 There are multiple ways to open a smart object in Photoshop. Refer to the Photoshop user guide for more information.